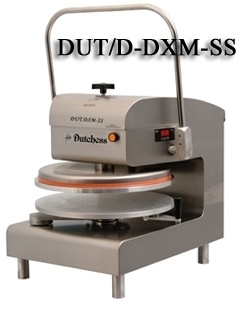 DUT/DXM-SS Manual Pizza & Tortilla Dough Press -- Dutchess Bakers Machinery Co. Inc. The Model DUT/DXM-SS manual stainless steel Pizza Press is the most efficient, durable and easiest way to press Pizza dough. With the large 18" heated top platen you can warm press, cold press or par bake pizza crust in seconds. The lightweight bottom platen easily swings out to allow you to quickly load and unload product. The Cam over-lock linkage eliminates the need to develope a "touch" in order to press dough to a uniform diameter and thickness. Heated top platen to 450°F or use it without heat for cold pressing. Easy-to -use digital temperature readout. 120 volt, 900 watts, 10 amps.